Bishop’s Castle to Shelve– Approximately 13 miles with 2500 ft ascent / climbing – 1 Mile = 1.6 Kilometres. The walk starts off uphill from the Town Hall and goes in a westerly then northerly direction over farmland and moorland with very little road/lane walking. After gaining height, the walk continues along a green lane where there is a self-clipping point. It seamlessly crosses the border into Wales. Walkers then turn right down farmland to cross the the valley of the River Camlad, its claim to fame being the only river then runs from England into Wales! 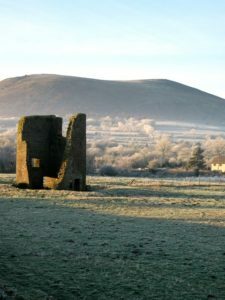 The route crosses and B road leading to Montgomery and then more farmland to the main A 489 – the Ludlow to Welshpool road. Acoss than and walkers are heading for the Welsh hills of Roundton and Corndon. But on the lower slopes of Roundton is the Nature Reserve where there is the first check-point. 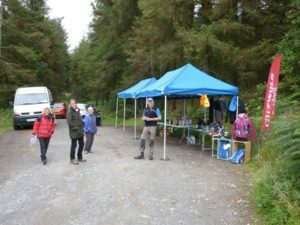 Refreshments are available and walkers can refill water bottles. Walkers continue on a permission path to the summit of Roundton where there is the second self-clipping point. 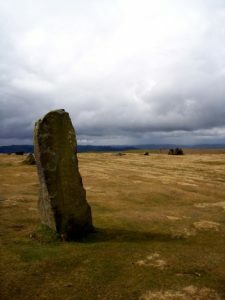 Now the route continues through farmland, bracken and moorland to the big bulk of Corndon where there is a trig point at the summit and the third self-clipping point. The path descends steeply to head for the stone circle at Mitchells Fold. Bishop’s Castle to Shrewsbury road. 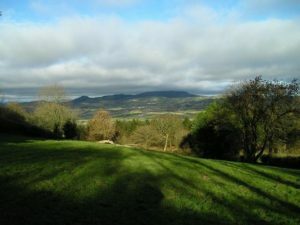 Across the road on the edge of a forestry plantation is the lunch spot at Shelve – the stopping point for 13 miles walkers and the start point for 11 milers.